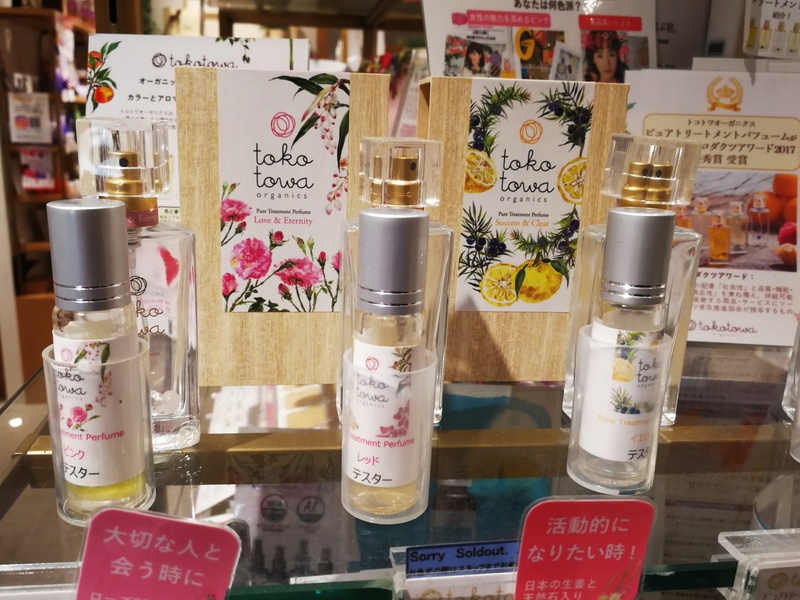 Today I visited organic perfumery chain Cosmekitchen’s Naturopathy outlet in Shinjuku’s luxury Newoman department store to check out the aromatherapy fragrances of Japanese organic perfume brand Tokotowa Organics. I had met the founder of Tokotowa’s parent company Organic Styles at the Natural Cosmetics Conference 2017 in Berlin just last month – and of course I was immediately interested. A Japanese aromatherapy brand? Cool! Tokotowa was launched in June 2016 and the company is based in Nagoya. However, the perfumes are comparatively widely available; many Cosmekitchen perfumeries across Japan stock Tokotowa’s fragrances, some Tokyu Hands stores do as well; but the shop finder on the brand’s website (use Google Translate) also lists other organic and green retail chains that sell Tokotowa perfumes: Natural Food Store F&F, Caris Seijo and Urban Comfort, for example. There are five fragrances: Love & Eternity (Pink), Passion & Warm (Red), Success & Clear (Yellow), Relaxing & Harmony (Blue) and Purity & Dreams (Violet). Each of these is available as a fragrance spray or an oil-based roll-on and all fragrances are more than 95% organic. The perfume sprays are based on organic alcohol (derived from sugar cane) while the perfume roll-ons are based on organic jojoba seed oil and other moisturising plant oils, like argan oil or rice bran oil. You can apply the roll-on fragrance on wrists and neck but also use them to hydrate split ends or moisturise your cuticles. The fragrances are blended in Japan by a professional perfumer and a color aroma therapist, and the essential oils used in the blends are so marvelously Japanese! Yuzu (Japanese citrus, and one of my favourites! ), for example, Japanese ginger; daidai (a type of Japanese orange fruit), getto (Japanese shell ginger) or kuromoji (Lindera Umbellata; a shrub which, Google tells me, has a warm and spicy aroma). Each perfume spray flacon contains several semi-precious stones or crystals selected to help charge and enhance the effect of the fragrance; the roll-ons contains one semi-precious stone each. What a nice touch. The outer packaging is decorated with drawings of the plants used in the fragrances. These are aromatherapy blends – therapeutic fragrances – so the brand recommends certain perfumes for specific occasions. Love & Eternity (Pink) contains rose and getto essential oils. Getto is a plant which grows especially well in tropical regions; the getto aroma in this fragrance is from Okinawa in the Ryuku island group. According to Tokotowa, the Getto plant is associated with physical attractiveness and communication abilities. The Pink aromatherapy blend therefore helps you bolster your spirits and gives you a boost of confidence when you meet a special someone, spend time with family and relatives or want to feel more attractive. It is also said to help balance out women’s hormone levels. The precious stones in this flacon are Rose Quartz and Rock Crystal. Passion & Warm (Red) is described as a warm and spicy fragrance blend which is ideal if you want to increase your motivation, when you start something new, are studying or working or simply want to warm your body. Or you need help in controlling your appetite. The Red fragrance contains ginger essential oil from Kochi on the island of Shikoku blended with sandalwood and the semi-precious stones in this bottle are Carnelian and Rock Crystal. Success & Clear (Yellow) is a refreshing, zesty fragrance which combines yuzu from Kochi and juniper berry. This fragrance blend is a good perfume to wear if you need to make an important decision or have to face a new challenge; when you go out to a party or have to make a work presentation or you want to boost your metabolism. The semi-precious stones to help you along in this are Tiger’s Eye and Rock Crystal. Relaxing & Harmony (Blue) is a sweet, fresh and uplifting scent to help you when you need to improve communication with family or friends, when you feel frustrated or anxious; your shoulders and neck are all tensed up or if you need to release some stress. The Blue fragrance combines vanilla and daidai essential oil from Ehime in North Western Shikoku. In Japanese, daidai means something like “generation after generation” – when the fruit of this tree has ripened it remains hanging on the branch for several years; so it’s also considered a good luck charm. This bottle contains Rock Crystal and Blue Onyx. Finally, Purity & Dreams (Violet) contains a blend of Kuromoji from Kyoto and lavender. Kuromoji (Lindera Umbellata) is also called spicebush or spicewood; I read that its leaves and twigs are used for decorations in the house but it is also made into an herb tea. Apparently it is also considered a natural sleeping aid. The Violet fragrance is for use at night-time, when you need to de-stress or you can’t sleep but it is also recommended as an aid for meditation or when you need to make life plans or draw up new goals in life. This fragrance bottle contains Rock Crystal and Amethyst. Nice combination. However, Tokotowa recommends that you look at the colours first to see which you feel drawn to, then read the description of the perfume and select the one that speaks to you and finally, try out the fragrance on your skin to see whether you like it. Based on the descriptions I expected that my favourites would be the Purple, Blue or Yellow fragrances. However, when I actually tried the different perfumes, I was surprised to realise that Passion & Warm was the clear winner (new beginnings and all that?!). I love the warm scent of cloves which is tempered by sharp and spicy ginger notes so the overall fragrance is aromatic and voluptuous but not overwhelming (cloves often tend to overpower anything in their vicinity!). The fragrance blend lingers on my skin. I like it! Each Tokotowa fragrance spray flacon contains 24ml and carries a different price tag. The Blue and Yellow perfumes retail at around 6000 Yen (60 Euro), Purple and Red are priced at 7000 Yen (70 Euro) while the Pink fragrance costs 9000 Yen (90 Euro). The roll-ons are slightly cheaper, they are priced at around 3000 Yen (30 Euro).